This report contains the attestation review reports of the U.S. Department of Justice’s Assets Forfeiture Fund, Criminal Division, Drug Enforcement Administration, Federal Bureau of Prisons, Office of Justice Programs, Offices of the United States Attorneys, Organized Crime Drug Enforcement Task Forces Program, and United States Marshals Service’s annual accounting of drug control funds and related performance for the fiscal year ended September 30, 2016. The Office of the Inspector General performed the attestation reviews. The report and annual detailed accounting of funds obligated by each drug control program agency are required by 21 U.S.C. §1704(d), as implemented by the Office of National Drug Control Policy Circular, Accounting of Drug Control Funding and Performance Summary, dated January 18, 2013. 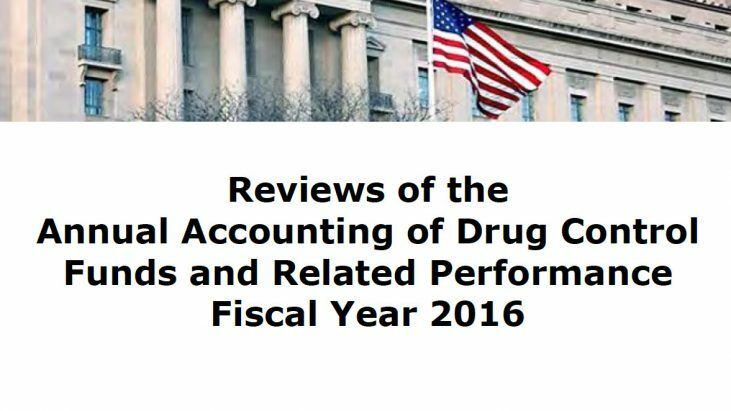 The Department of Justice components reviewed, reported approximately $7.8 billion of drug control obligations and 23 related performance measures for fiscal year 2016. The Office of the Inspector General prepared the attestation review reports in accordance with attestation standards contained in Government Auditing Standards, issued by the Comptroller General of the United States. An attestation review is substantially less in scope than an examination and, therefore, does not result in the expression of an opinion. We reported that nothing came to our attention that caused us to believe the submissions were not presented, in all material respects, in accordance with the requirements of the Office of National Drug Control Policy Circular, and as otherwise agreed to with the Office of National Drug Control Policy.